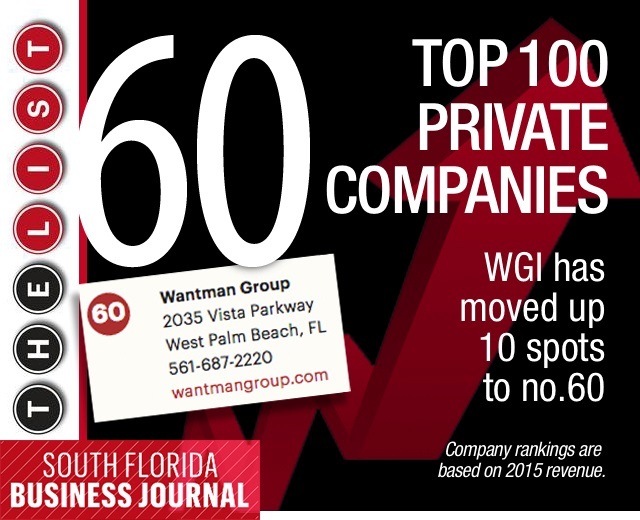 WGI was once again named in South Florida Business Journal’s List of Top 100 Private Companies, moving up to #60 from #70 a year ago. A Deerfield Beach-based company ranked first on the South Florida Business Journal’s list of 100 private companies. The company earned the top spot based on its $14.46 billion in 2015 revenue. There are more than 20 newcomers or returnees to the list, including Windhaven Insurance, which moved into the top 25. The complete private companies list includes contact information and comparisons to the previous year. This list is behind the SFBJ paywall and is only available to the publication’s subsribers.